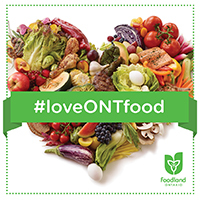 June 6-12, 2016 is Ontario Local Food Week! Register yourself, your class, your school, or your whole school board with Foodland Ontario before or after you celebrate Ontario Local Food Week. Download fun curriculum linked class activities to use during Ontario Local Food Week (see below). During Local Food Week share photos of your class activities (e.g. everyone sharing a snack), a favourite selfie, or what you love about local food. 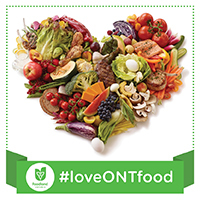 Tag your tweets using #loveONTfood to join the rest of the local food week celebrations. Download our Local Food Week Celebration Tip Sheet for Schools for other ideas about how you can celebrate. Ecosource’s Classroom Connects Curriculum Package (Gr 9-12): This package has 15 detailed lessons plans (with curriculum connections, assessment opportunities and student worksheets) to open meaningful conversations with secondary students about our local food system. They were written and conceived by Durham District School Board (DDSB) secondary school teachers and align with the Ontario provincial learning expectations for Science, Geography, Family Studies, Hospitality and Business. FoodShare’s Great Big Crunch 2016 Activity Guide (Gr 1-6): FoodShare’s Great Big Crunch invites students, teachers, educators and all good food enthusiasts to learn about healthy eating through the apple’s journey from seed, to harvest, to market, to table (and around again)! Ontario Agri-Food Education Inc. (Activities from Gr 1 – Gr 12): A wide range of downloadable curriculum-linked resources are available on the OAFE website. These have been designed to promote agri-food literacy. Classroom educators in grades 7-12 can also request a free Teacher Ambassador lesson and access agri-food career resources linked to the Ontario curriculum on OAFE’s other site www.growingcareers.ca. Ecosource is an Ontario-based community environmental organization that inspires personal action and responsibility through creative programming for youth and communities. Ecosource has been leading projects pairing local food procurement with food literacy in Ontario schools since 2006. Roots to Harvest is a not for profit and charitable organization in Thunder Bay that uses food and farming to engage, educate and employ high school aged youth. At the school level, Roots to Harvest works with schools and school boards in order to foster positive school food culture developments both with students and decision makers. Sustain Ontario’s Edible Education Network brings together groups in Ontario that are connecting children and youth with healthy food systems. The network seeks to better enable these groups to share resources, ideas, and experience, work together on advocacy, and facilitate efforts across the province to get children and youth eating, growing, cooking, celebrating, and learning about healthy, local and sustainably produced food.